Hot Stuff - not only for the summer! The spaghettit top in white is made from 100% cotton and is of the finest quality. White with vertical REMOVE BEFORE FLIGHT Text in red. The spaghettit top in red is made from 100% cotton and is of the finest quality. Red with vertical NO PUSH NO STEP NO TOUCH Text in white. The spaghettit top in is made from 100% cotton and is of the finest quality. 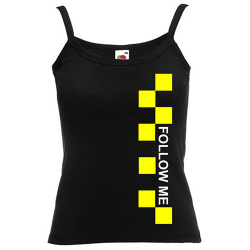 Black with yellow imprint and FOLLOW ME text in white. Description: Bandeau Bra, 45% combed cotton, 45% modal, 10% lycra elastane, jersey. Cropped bra top with thin straps in the flattering bandeau. With FOLLOW ME imprint. Beautiful - not only underwear. Hip-Shorty, 95% cotton, 5% spandex, waist with satin set off. White with red imprint REMOVE BEFORE FLIGHT. Red with white imprint NO PUSH NO STEP NO TOUCH. 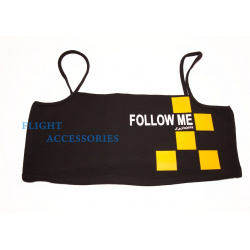 Black with yellow imprint and text FOLLOW ME. Bikini String-Tanga, 95% cotton, 5% spandex, waist and leg cutouts with satin set off. Red with white imprint REMOVE BEFORE FLIGHT. Transport Jaki, Jak Jaki s.p. SI56 3000 0001 5095 370, Sberbank d.d. SI56 0510 0801 1837 775, Abanka Vipa d.d. Potrebujete dodatne informacije ali pomoč?